← It’s All Up In The Air…Birds that is! I bought a yard of the geometric fabric a while back with the intent of making pillows. That project didn’t happen. Instead, I used it to make art for a very long wall in my living room. Starting, I cut the fabric in half, sprayed glued each piece to cardboard cut to fit the frame (foamboard works too) then cut the excess off. I reused the mats from the original framed art, put it back in the frame and hung them on the wall. 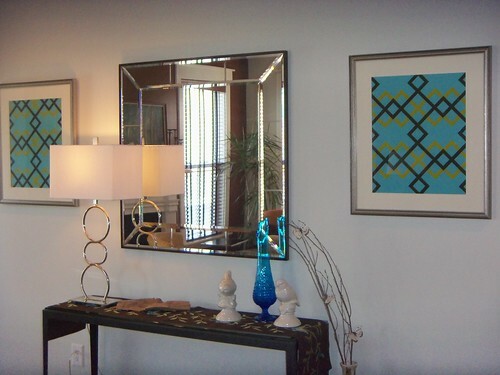 The silver wooden frames are from Habitat for Humanity. 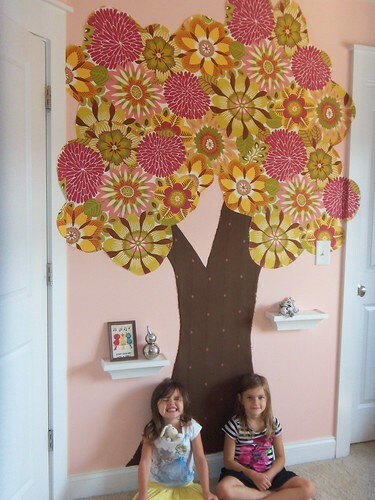 I was inspired to create this “tree” for my youngest daughter after I saw a photo of a giraffe cut-out from vintage wallpaper hanging in a kid’s room. I loved the idea but wanted to use fabric instead. I got a remnant of a brown with cherries on it for the trunk, a yard of bold, fun floral for the leaves and I cut them both to shape. I thought I could hang it with liquid starch, but it was too heavy. So instead, I had to use a spray adhesive, spraying both wall and fabric for tackiness. It’s been 3 years now and it’s held up great, but it will peel off easily when she’s ready for a change. This fabric is just so sweet. I wanted to use it in my older daughter’s bedroom. I simply spray glued it to a piece of cardboard, cut off the excess and framed it in a repainted wood frame. Art does not have to be expensive, just creative! 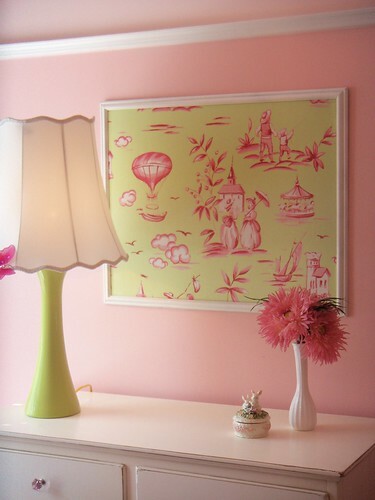 Whether you use fabric on the wall or on the sofa…consider it a piece of art! 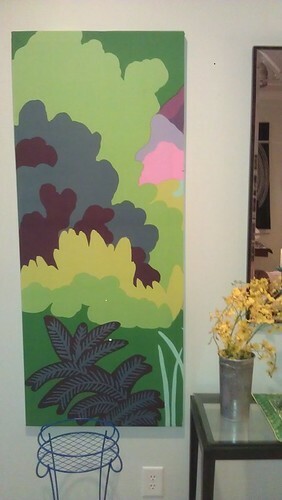 Marimekko fabric stretched over a wood frame, a custom piece measuring approximately 2’x 4.5′ ($75). The tiny white and black dots are on the photo only, not the art. This is a truly unique piece and will make a statement anywhere! Call or email with questions or to purchase, 843.478.0706 or sharon@sharonpayerdesign.com. As always, thanks for looking. And if you enjoy the blog, pass it on to a friend, they may too! REUSE THE BEAUTY OF THE PAST TO CONSERVE WHAT WE HAVE FOR THE FUTURE. Visit STYLE REVIVAL at the Antiques Market on Coleman Blvd for additional special finds and one-of-a-kinds. 62 Responses to Fun With Fabric!